Spring break is in full swing here in Orlando! With beautiful weather and world-renowned attractions, it’s no surprise that so many travelers make Central Florida their vacation destination. Some activities are tried-and-true, but if you’re looking for something fun to add to your itinerary, we’ve got you covered. Orlando’s incredible theme parks are one of the biggest draws for vacationers. Though they’re probably on your list already, a visit to SeaWorld Orlando, Universal Orlando or Walt Disney World is always a great way to spend part of your trip. Spend the day outside enjoying Florida’s awesome weather at one of our state parks! Both Blue Springs and Wekiwa Springs are within an easy drive of all of Orlando’s attractions. Paddle in a canoe, take a dip in refreshing spring waters or see if you can spot a manatee! With miles and miles of fresh water, Central Florida is definitely the place to take an airboat ride. Everyone in your party will feel the adrenaline as you race along the water, and you might even see some of Florida’s unique wildlife! If you’ve got a rare rainy day in Central Florida or you’re ready to enjoy some A/C, head to a nearby bowling alley. Hitting the lanes is a perfect indoor activity in Orlando, and with good food and drinks and plenty of fun, it’s an affordable afternoon for everyone in the group. Swing like George of the jungle at the most epic outdoor rope adventure park in Florida! Tree Trek’s obstacle course allows you to take on everything from wobbly logs and sky-high skateboards to Tarzan ropes and hanging nets. 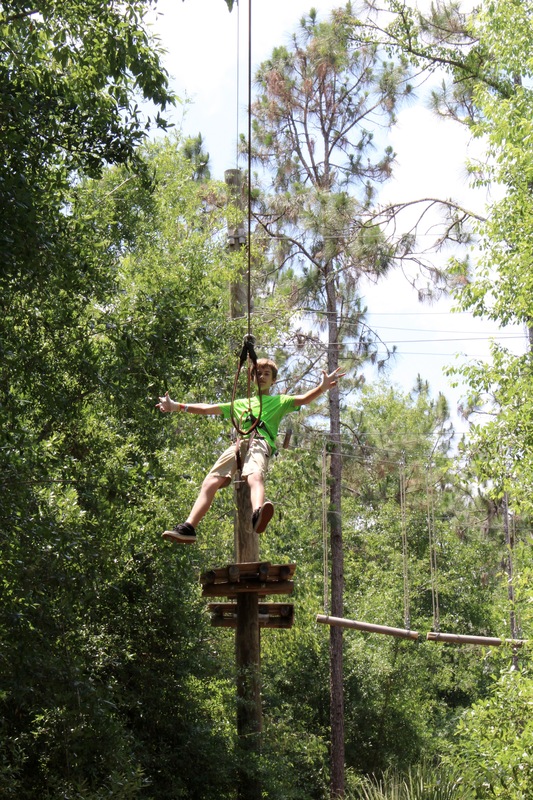 Zipline Orlando or take a true tree to tree adventure on our courses! There’s something for everyone, with two courses specifically for kids, three for junior climbers and four for adults. Finish your day with an adrenaline-pumping ride down our 425’ twin adventure park ziplines. At our rope park, you’ll enjoy getting outside, escaping the crowds, and making incredible memories of your adventures in Florida. Book your treetop trek with us today! Call us at 407-390-9999—and enjoy your spring break in Orlando!